BIO ~ Juan is a neutered male New Guinea singing dog. We rescued him in the summer of 2015 when he was 8 years old. PERSONALITY ~ Juan is a sweet and lovable boy. He is much shyer than his mate, Tia. It takes some time for him to trust his new caretakers. Once he gets to know someone, he’ll ask for attention all the time and will happily go out for enrichment walks! RELATIONSHIP ~ Juan lives with a female New Guinea singing dog, Tia. They were originally a breeding pair, so are a bonded pair. LIKES ~ Juan likes slow-paced walks on warm days and enrichment bones. He also likes spending time inside their house when Tia will let him in. DISLIKES ~ Since he and Tia are used to much hotter climates, Juan does not like the cold weather. They have a big, cozy house to keep them warm at night. Juan doesn’t like when Tia gets bossy and won’t let him inside. FUN FACTS ~ Juan and his companion Tia did not have names when they arrived at WSWS. The names we gave them were inspired by their previous location – Tijuana, Mexico! WISH LIST ~ When Juan came to live at WSWS, we realized quickly that he had serious allergies and took him to the dermatologist. Tests revealed that our poor Juan is allergic to almost everything, including alfalfa, mustard, and dandelions. Every morning, he and his bonded mate, Tia, who also has allergies, get allergy medicine to help relieve their symptoms. They would love if you would order some for them. Juan is Still Looking for Sponsors! JUAN’S HISTORY ~ Some consider the rare and wild New Guinea singing dogs to be most like dingoes, but others report that they have completely unique DNA. They get their name from their equally unique howl which is nearly impossible to describe. Some say it sounds like a barbershop quartet, and others describe it as an ethereal trill. When we rescued our first group of singing dogs, Bono, Bowie, Foxy, Princess, and Reba, we heard there were less than 200 New Guinea singing dogs in captivity, and that they may already be extinct on their native island of Papua New Guinea. We read that on the island, Singers were seen more in pairs than in packs. Just recently, New Guinea singing dogs have been spotted in the wild again. For 30 years or so, no one in their native country had seen them at all, although they reported hearing them sing. Juan and his mate Tia were held for over 6 years by a breeder in Tijuana, Mexico. Those who saw where they lived said there was nothing natural for them to enjoy, not even a tree. The sweet couple was getting older and no longer able to breed, so they were going to be destroyed. A rescue team quickly came together to save their lives. New Guinea Singing Dogs are currently among the rarest wild canines. 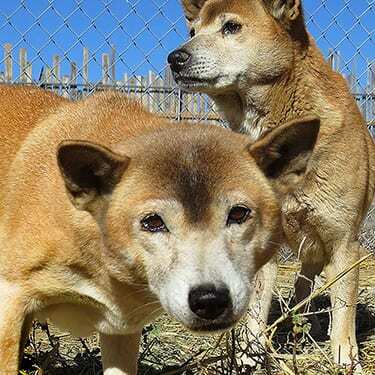 There are reputable conservation organizations, like The New Guinea Singing Dog Conservation Society, but now breeders have begun selling the small dogs for pets. Despite their size and how cute they are, these animals are not domesticated and cannot enjoy life as a pet. Lift your voice with ours that Wild Animals Are Not Pets! No living being wants to be caged and have their babies stolen and sold. If we all work together and never give up, we can make sure the wild stays wild.